Raanana, Israel – March 5, 2019: Leket Israel, in partnership with BDO, released its Fourth Annual Food Waste and Rescue Report. The report presents, for the first time in Israel, a detailed model for the estimation of food loss in the household consumption sector, its value and impact on households in Israel and how Israelis compare to other countries around the world. The Food Waste and Rescue Report reveals that food loss in Israel this year amounts to 2.5 million tons (5.5 billion pounds) with a market value of NIS 19.7 billion (US $5.5 billion), 35% of all food produced. Almost half of this loss, 1.2 million tons (2.6 billion pounds), is rescuable and valued at NIS 7 billion (US $2 billion). The findings of the Report show that the loss in household consumption in Israel amounts to approximately 880,000 tons (1,940 million pounds) of food, at a value of NIS 7.9 billion (US $2.2 billion). An average Israeli family throws out food worth NIS 3,200 (US $890) per year, equivalent to a month and a half of household food consumption expenditure. The majority of the wasted food are fruits and vegetables, with Israeli households wasting 23% as compared to the US at 28% and Europe at 19%. The Report reveals the impact of food loss on the cost of living: the effects of loss at all stages of the value chain increases food prices by 11% and the loss of food impairs productivity in the economy due to production and labor loss. To close the food insecurity gap in Israel, necessitates the rescue of 20% of food wasted worth approximately NIS 3 billion (US $834 million). Food rescue makes this possible at a cost of only NIS 830 million (US $230 million), 72% of the cost. This can be accomplished without even quantifying its environmental benefits. About Leket Israel: In 2018, Leket Israel rescued 2.2 million cooked meals from IDF army bases, hotels catering companies, and restaurants and 15.5 thousand tons (51 million pounds) of agricultural produce worth NIS 150 million (US $41.5 million). All this rescued food was then redistributed to 175,000 needy people weekly through Leket Israel’s network of 200 nonprofit agency partners throughout Israel. For more information, please visit www.leket.org/en. "This is the fifth summit between our three countries. We have been meeting regularly since our first summit in 2016. And as I said, our personal friendships grow stronger as our agreements grow longer and longer and detailed. And these bonds are not merely based on shared interests and geographic proximity—they are based on shared values in a very volatile region, very violent region. We share deep histories and rich culture. We are all vibrant democracies. We all value pluralism, freedom, and peace. And we are all threatened by forces of terror and religious radicalism. Our alliance is an anchor of stability and prosperity in the Eastern Mediterranean. But we have today a special guest with us, and the presence of our dear friend, the Ambassador of the United States to Israel, David Friedman, at our summit today reflects the US support for our partnership, for our projects and for our values, which the US shares. Today, we reaffirmed our commitment for the East-Med pipeline, discussed important aspects of the project, and we’re going to sign formally, officially this agreement in a few months. As we seek to build prosperity, a pipeline for prosperity, there are forces in our region that seek to build tunnels for terror. And a few weeks ago, Israel launched a campaign to expose and neutralize cross-border terror tunnels on our northern border with Lebanon. These tunnels were built by Hezbollah with direct support and funding from Iran. This is the Iranian web of aggression in the Middle East, which also terrorizes Europe and the entire world. Israel continues its operation against the Hamas terror tunnels, and will do so until its completion. As we speak, we’re employing means to neutralize these tunnels, and we’ll continue to act in Syria to prevent Iran’s effort to militarily entrench itself against us. We are not going to reduce our efforts; we’re going to increase our efforts. We have a unique partnership, a program, internship program for young entrepreneurs from Greece and Cyprus to intern at Israeli hi-tech companies. And I hope to see many more young and not-so-young entrepreneurs from both of your countries in Israel in the coming years." Following the Prime Minister's remarks, Cypriot President Anastasiades, Greek Prime Minister Tsipras and US Ambassador to Israel David Friedman also issued statements. The leaders then toured a cyber and innovation exhibit at the Carasso Science Park in Beersheba. 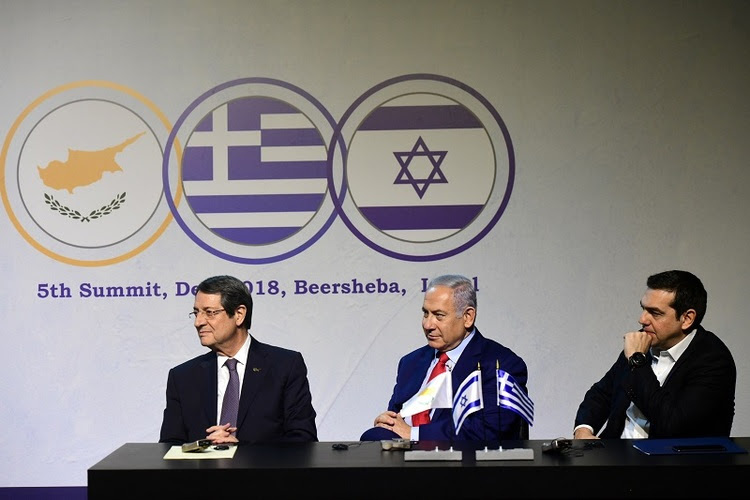 Prime Minister Netanyahu, Cypriot President Anastasiades and Greek Prime Minister Tsipras signed a joint trilateral declaration. Signing the (below) agreements for the Israeli side were Communications Minister Ayoob Kara, Science and technology Minister Ofir Akunis, Israel National Cyber Directorate head Yigal Unna and Israel Meteorological Service Director Nir Stav. 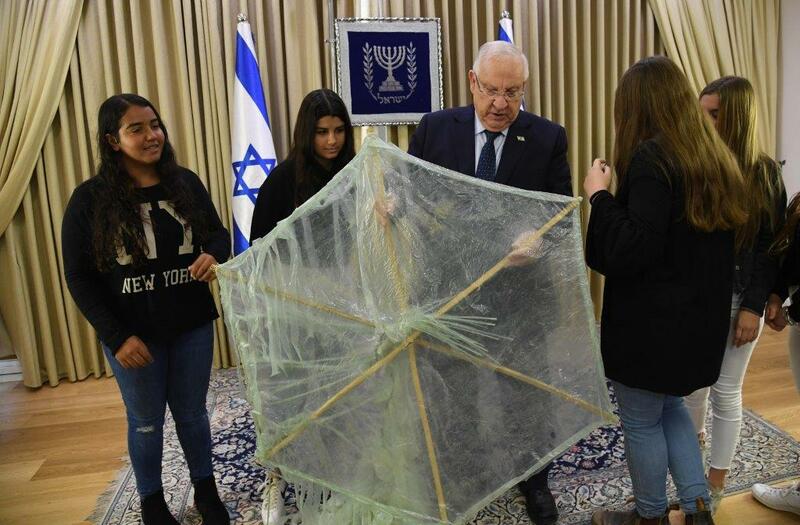 President Reuven (Ruvi) Rivlin today, Tuesday 6 November / 28 Cheshvan, met members of the Otef.gaza Instagram page who live in Israeli communities around the Gaza Strip, at the President’s Residence. The page, which opened two weeks ago to give expression to their lives as residents of the area, already has 61,100 followers. 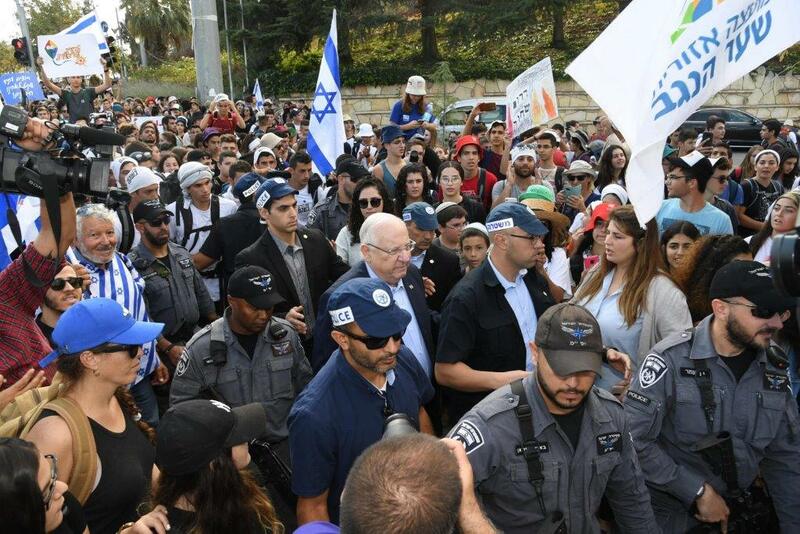 The members who came to the President’s Residence were May Caspi, Meshi Elmakays, Yam Yefet, Shani Peretz, Lee Cohen and Kim Ovitz who are administrators of the page. 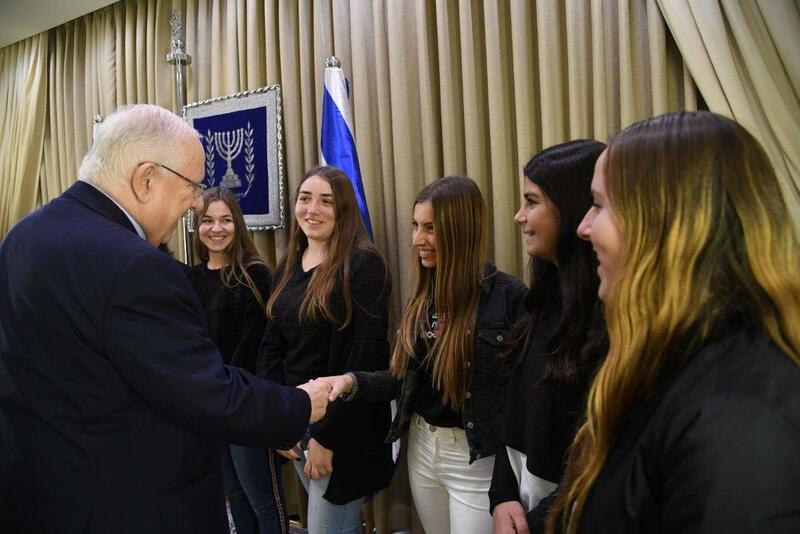 The girls were given a tour of the President’s Residence by the visitors’ center that recently opened to the public, and then met with the president for a conversation. 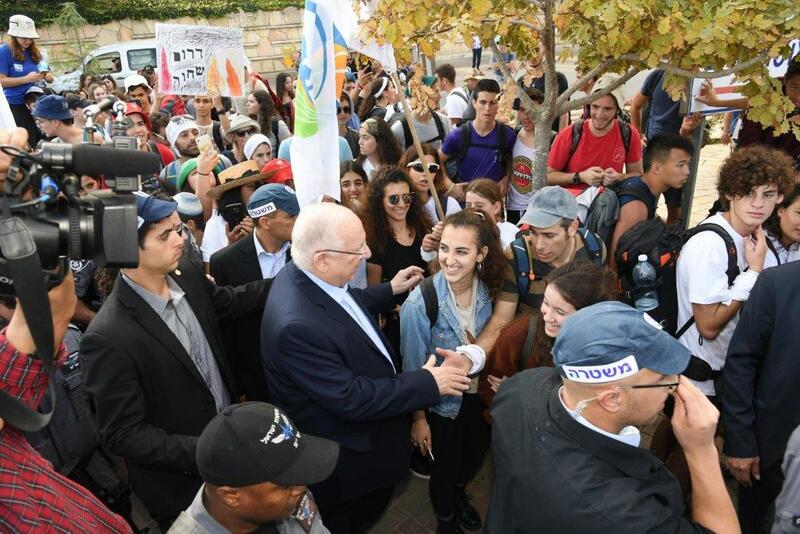 President Reuven (Ruvi) Rivlin today, 8 November / 30 Cheshvan, met the young people marching to Jerusalem from the area around Gaza as they entered the city today. 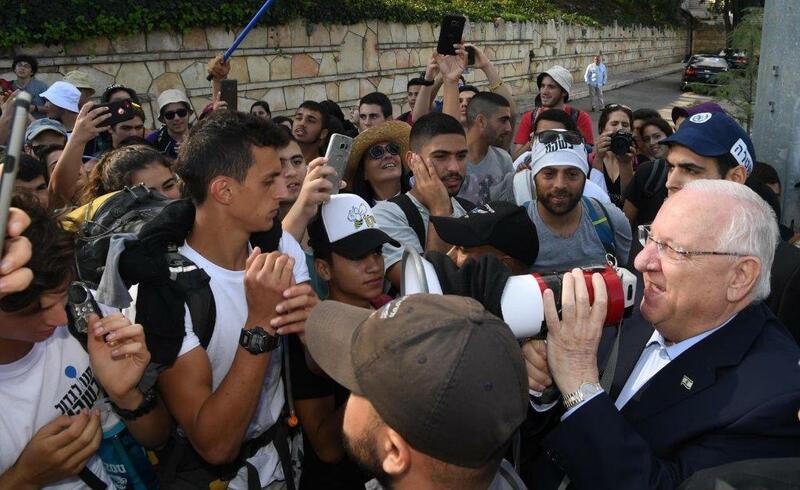 The president marched with the young people who continued from there towards the Knesset. 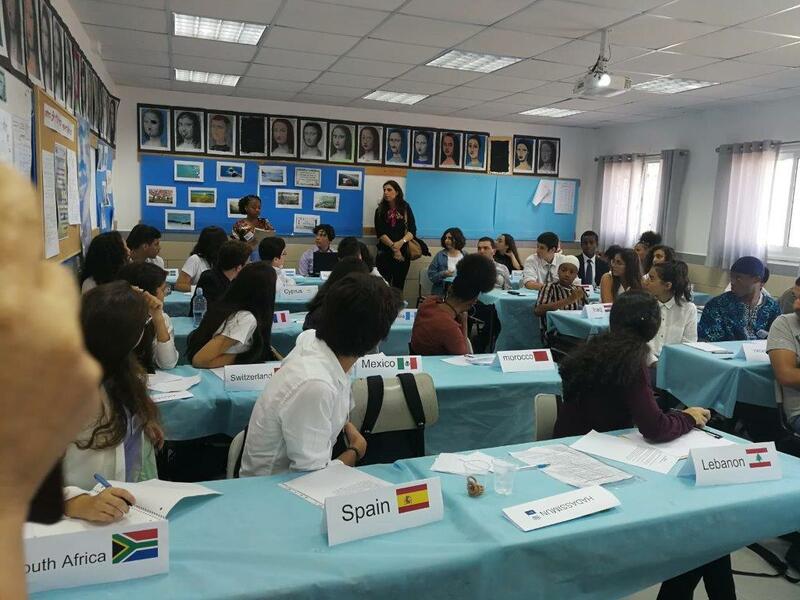 On Wednesday, October 10, the 2018-2019 Israeli Model UN circuit opened with the first HadassimMUN conference. 150 students from two dozen cities and towns around Israel met at the Hadassim school in Even Yehuda to discuss important topics related to the conference theme of Technology: Sports; Unmanned weapons; Education; Outer Space, and Health. As the first conference of the year, HadassimMUN initiated over 100 students to the concept of Model United Nations. Thanks to the tireless efforts of the hosts, led by MUN coordinator and HadassimMUN Director Robin Flam and her MUN club, the new students were able to quickly adjust, gain confidence, learn, and have fun. After a full day of debating and negotiating, the delegates voted on their resolutions and had dinner. The committees then joined together in the auditorium for the awards ceremony. Robin Flam opened the ceremony by welcoming all of the students and teachers to the school and expressing her gratitude for those who helped make the conference such a success. 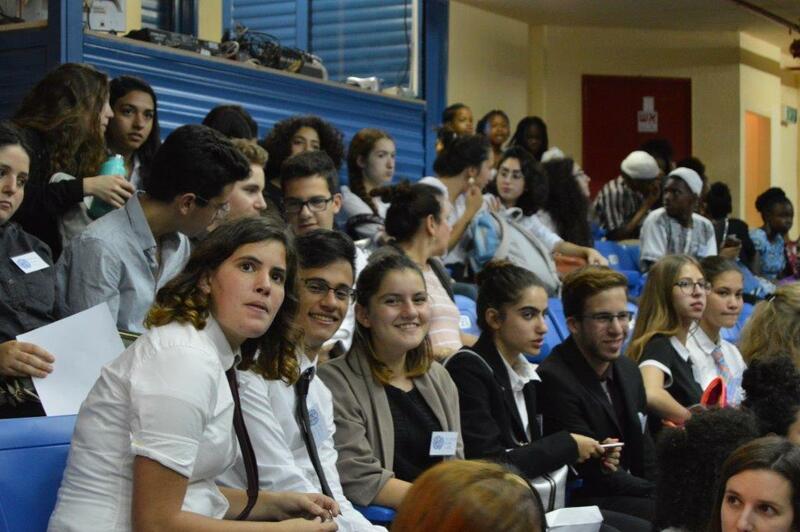 Secretary-General Romi Tzur talked about how excited the Hadassim MUN club was to have hosted its first MUN conference. The conference was organized by Debate for Peace and supported by the US Embassy in Israel. At the awards ceremony, US Embassy Consular Officer Jessica Kuntz spoke to the students about how important their efforts were, to learn more about how the world works. She praised the students for taking this courageous first step and assured them that the skills and experiences they could gain through MUN would be helpful for them in many fields and future opportunities. Two short video clips were then shown one about the founding of the HadassimMUN club, and one with photos and videos from the day’s conference. During the awards part of the ceremony, the top delegates in each committee were called up to the stage to receive their awards. These included Amit Weinstock (Petah Tiqva), Ariel Talmor (Hand in Hand) and Rani Khoury (Hand in Hand) in UNOSDP; Avital Aleph (Modi’in), Yarin Benayoun (Hadassim), and Ron Ben Chail (Modi’in) in DISEC; Adi Kelty (Hadassim), and Ahmad Dweek (Rowad al-Quds) in ECOSOC; Ayala Grossman (Pelech); Hanna Zohn (Hadassim), and Jonathan Levi (Hadassim) in COPUOS, and Maayan Dahan (Hadassim), Yafa Nassar (Bashaer), and Ella Justus Segal (Modi’in) in the WHO Committee. HadassimMUN 2018 was part of the Debate for Peace MUN series, as an Interfaith Encounter group supported by the U.S. Embassy in Tel Aviv. The next conference will be on November 8th in Sakhnin. Immigrants from Around the World Come Together for Olim Beyachad Party Launch .